I honestly cannot comprehend the fact that another month has passed. 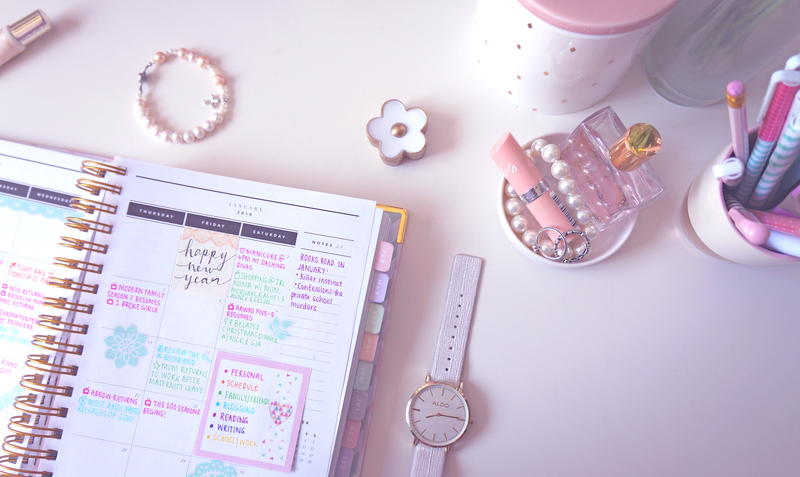 I told myself that 2016 would be the year I finally begin to blog consistently, and though it's been a bit of a bumpy ride, it's definitely been rewarding. So much has happened over the course of the past month and I thought that this was the perfect opportunity to highlight some of the reading related things that occurred in January. Let's get into it! As you can see, I've had an excellent reading month! Not quite so much in the quantity of books I've read, (I was aiming for six) but everything that I have read so far this year has been incredibly enjoyable. One of my goals for this year was to read books that I enjoy, and not waste time reading books I am unhappy with. I actually almost made it to six books this month, though I am currently still reading See How They Run by Ally Carter. I'm absolutely loving it, and I know it will be finished very early into February. I only posted three blog posts this month. *hides in shame* Though my posts haven't been staggering in quantity, I've spent a lot of time working on this blog, specifically future posts and more to do with my vision for it. 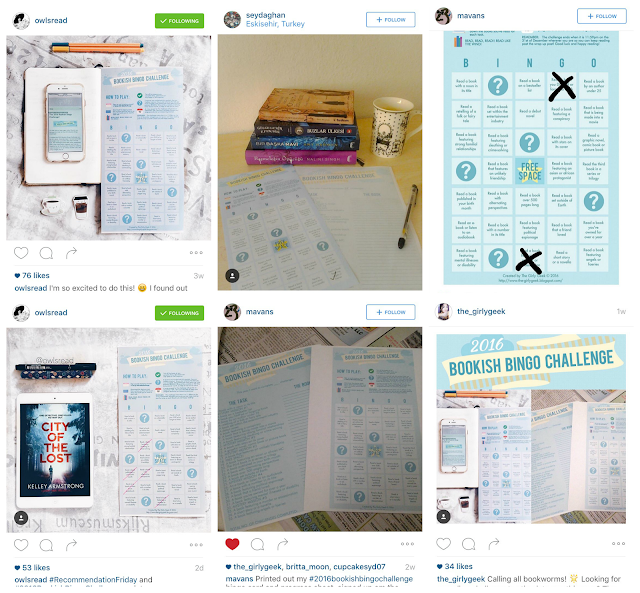 This month also marked the beginning of the 2016 Bookish Bingo Challenge, which took up a GIGANTIC amount of my time. This challenge is one of my favourite things to do, and I've made some big improvements this year. I didn't really anticipate how big it would become, but there is quite a bit of admin that goes along with it. Do not fear about the little amount of posts in January, because I've got some surprises in store for the rest of the year that I am VERY excited about. Stay tuned! One of the best parts about hosting this challenge is seeing all of the lovely pictures, tweets and blog posts you guys share about the challenge! 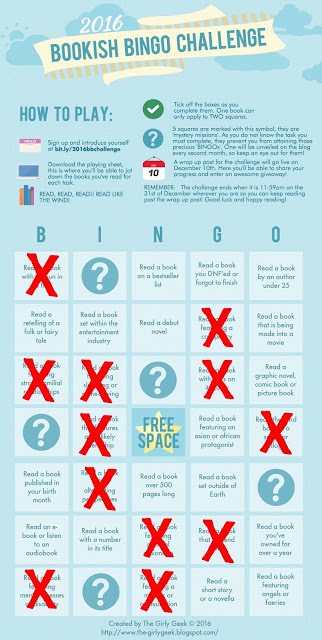 I am so thrilled you are all enjoying it, and it honestly makes me emotional seeing pictures of your bingo cards all printed out and pretty. Here are some of my favourite photos/mentions from all around the interwebs! Shoutout to you guys for being the sweetest peeps on the planet!! 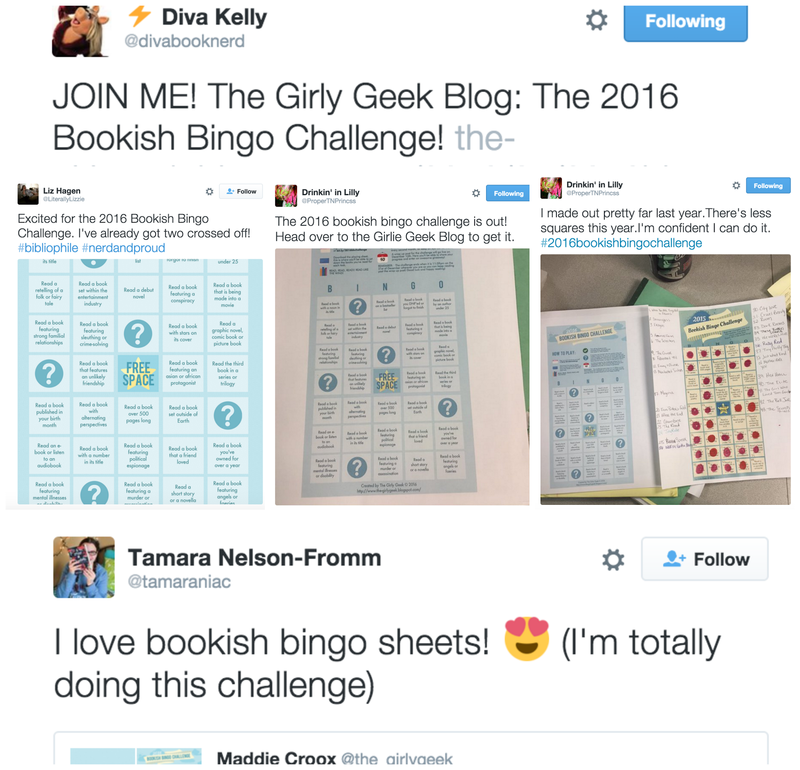 I'm so, so, so, thrilled you all are enjoying this challenge as much as I have enjoyed creating and hosting it! KEEP ON READING AND SPREADING THE BOOKISH LOVE!! Speaking of instagram, your girl has been all about it recently. I've really been inspired to take more photos, and I've even been sticking to a theme. As you can tell, I've been loving the lilac as of late. 2016 has brought about a LOT of change for me, and it's taken a little bit of adjusting, but I think I'm getting the swing of things. Now that I'm no longer in high school (hurrah!) I thought I'd have a lot of free time on my hands to read, and blog, but that really hasn't been the case. My mum has returned to work and I have been tasked with looking after my baby brother during the week days. He's only 7 months old so at times it can get tricky, but child care is bloody expensive and I'm happy to spend quality time with him. I've basically been caring for him everyday anyway, only now it's full time. It's exhausting work, but he's adorable, so I see no issue! Hahah. Another exciting thing happened this month, I got accepted into university! (My first preference too!) I'm absolutely ecstatic about it. I won't be starting until August though, I'm still looking after my brother for a little bit, but I'm excited to get back into the grind and continue with my education! For those wondering, I'm going to be beginning with a Bachelor of Commerce majoring in Marketing, however in my second year I will be transferring into a Bachelor of Marketing and Media! I've always enjoyed education, but towards the end of high school I had a hard time with social circles, etc, that made my time a little less enjoyable, however I'm really thrilled to begin this new chapter of my life! 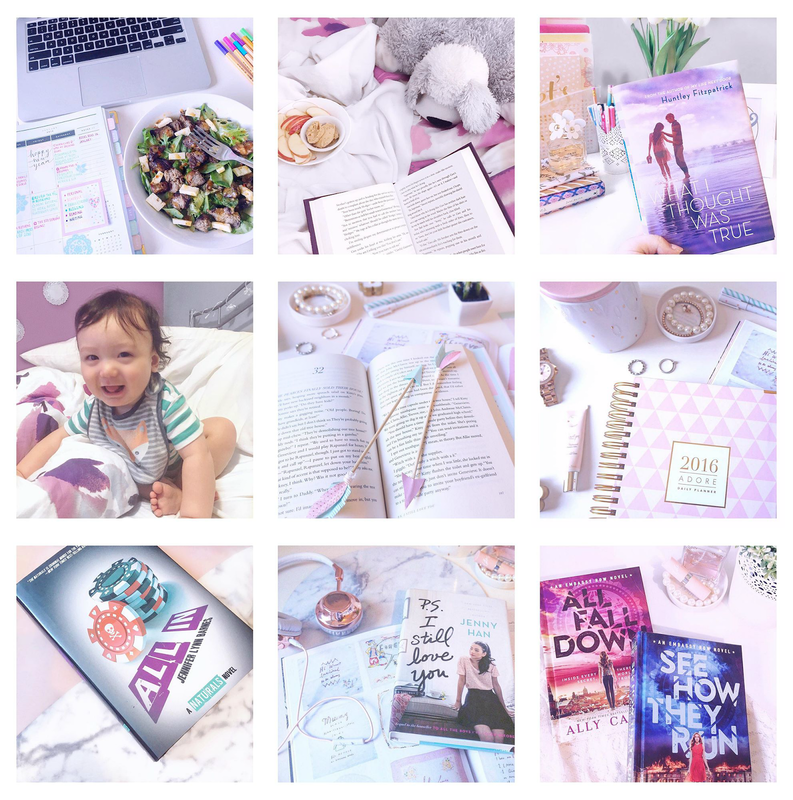 Here I share some of my favourite blog posts from the month, which are not necessarily bookish, but amazing nonetheless. That's it from me this month! So much has happened, I'm sure I probably left something out. I hope you've all had a stellar month and have read some incredible books. Happy reading! !